Supervisor Mike Wilson has introduced a resolution which would: (1) commit the County to completing a Climate Action Plan by 2020; (2) establish a goal of 100% clean and renewable energy for the County by 2025; (3) formally state the County’s support for the Paris Climate Accord. Transportation is by far the county’s biggest source of greenhouse gas emissions, so this resolution – particularly the first part – should have a big impact on our local transportation system. Come out on Tuesday to let the Supervisors know how important this is! We know you thought we’d stick with bike lane obstructions forever, but sidewalks are important too! 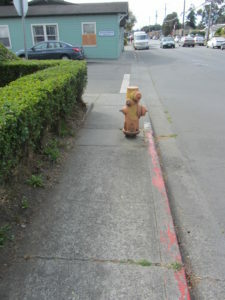 In fact, sidewalk obstructions are so common that they almost seem unremarkable. 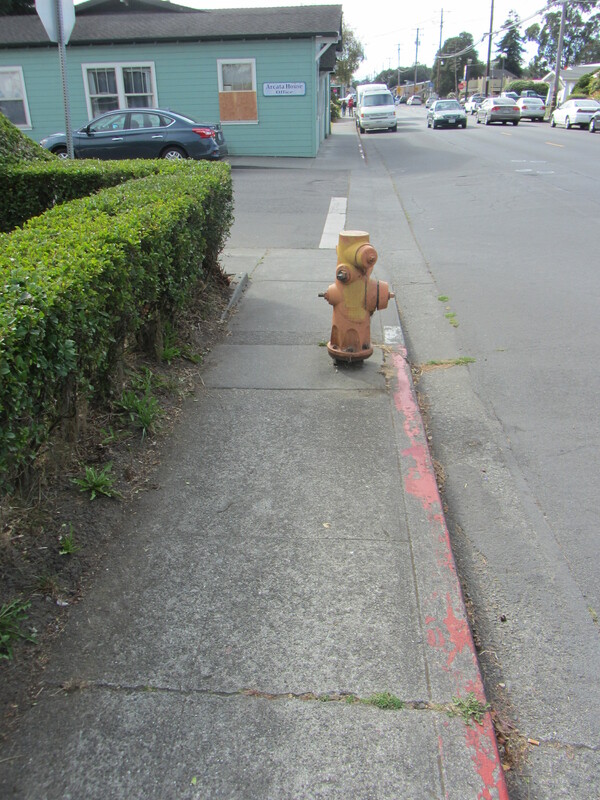 But regular placement of objects like this fire hydrant in sidewalks often prevents wheelchair passage and always prevents people from walking side by side or passing each other safely and comfortably. Walking is the lowest-impact form of transportation, and we should make it as safe, easy and comfortable as possible! Send your pictures of bike lane or sidewalk obstructions to colin@transportationpriorities.org. Laura Hughes of the North Coast Growers Association, Erica Grey of Community Pride and Peace, and local business owner Daniel Bixler made the cut. Presumably, the task force will now start meeting. CRTP will be there to continue advocating for a redesign that’s more friendly to non-vehicular users! The lesson seems pretty clear: Finish the trail! In related news, the County responded to a Grand Jury report about the Bay Trail that described the missing trail segment, where riders now use the shoulder of Highway 101, as an unsafe “interim trail.” We gotta agree with the County on this one; that’s not really what’s going on here. Again: Just finish the trail! The Times-Standard this week featured a pretty good explanation of how gas taxes work, a complicated and arcane but still important subject. Can We Have Good Transit in Low-Density Areas? In a fascinating opinion piece, urban planner Jonathan English makes the case that the demise of successful public transit in much of the country over the last century is not really due to competition from the car, but rather to bad management and underinvestment in service. He claims that even low-density areas can have successful transit – in other words, compete with car travel – if they invest in good service. North Coast transit advocates, take note.